The film opens up depicting Indian soldiers being ambushed in Manipur, followed by retaliation by the forces on terror bases across the India – Myanmar border in the North East. 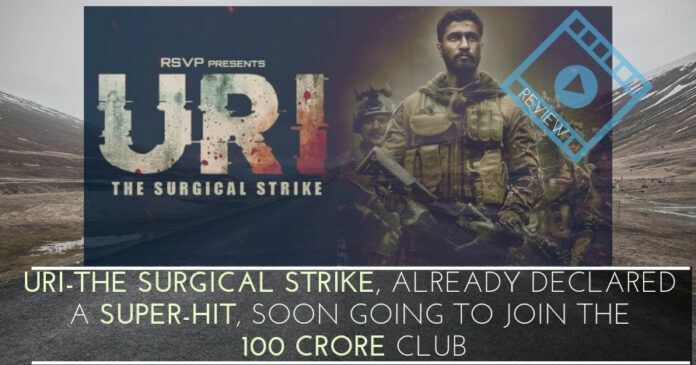 In the first week, URI has already collected over 70 crores at the box office. Since the film is based on the surgical strikes conducted in 2016 by the Indian Army, against militant launch pads in Pakistan occupied Kashmir (PoK), it is attracting the audience of all age groups, especially families. The patriotic fever is on full ‘Josh‘ at least inside the four walls of over 2000 multiplexes across India. According to trade analysts, “the film is expected to attract large crowds in the run-up to the Republic Day celebrations”. The star cast of the film led by Vicky Kaushal is already a house hold name. It is not for the first time a movie has been produced on border action by Indian filmmakers. Bollywood directors have been repeatedly treating Indian audience with their craft by bringing out different shades of personalities of a serving army officer. Though director of the film has taken some cinematic liberties to tell the story on screen but in the bargain he manages to evoke strong passions among the audience who walk away with their heads held high. Some excellent movies on 1962 war, 1965-1971 war and more recently Kargil war were produced in the past and attracted huge response at the box office. Then what makes this recent production stand out in the long list of movies. The simple answer is- the new format in which this movie has been presented before the audience. It captures the imagination of the audience and the entire nation and brings back the memories of the REAL SURGICAL STRIKE. Though director of the film has taken some cinematic liberties to tell the story on screen but in the bargain, he manages to evoke strong passions among the audience who walk away with their heads held high. The timing of the movie’s release is suspect. We are in the buildup to the polls, there is no doubt what Uri is intended to do: to tell us that patriotism and nationalism, those stellar virtues which will cement ‘a new India’ vests in these worthies (PM Narendra Modi and their faithful alone). The film, divided into chapters, starts off a year before the September 18, 2016 attacks on Indian soldiers at Uri and gradually it leads to “surgical strikes” on terror factories across the Line of Control in Pakistan-occupied Kashmir. The lead actor of the film, Vicky Kaushal, has anchored the role of Major Vihaan Singh Shergill, with precision. He has devoted quality time in shaping his physique and displayed mental toughness of a trained para commando with ease. His mannerisms as an officer from the armed forces who is solely focussed on one goal are bang on. Dialogues Like “Naya Hindustan Hai, Ghar Mei Ghusega Bhi Aur Marega Bhi”, Or Vihaan’s conversation with his colleague where he Says“Vihaan Sath Ho To Koi Marr Nahi Sakda” trigger more josh among the audience. From the first sequence itself, Director Aditya Dhar makes it clear that the film is not for faint-hearted people. From there, the story follows Major Vihaan Shergill, who seeks retirement owing to his mother’s ill health (played by Swaroop Sampat) as she suffers from Alzheimer’s disease. Prime Minister is shown passing necessary instructions to his Army Chief and National Security Advisor, at a dinner meeting, to organise his posting in New Delhi so that the army officer can serve both Mother Nation and look after his ailing mother. In the meantime, Pakistani terrorist outfits carry out an attack at Uri Army Base camp in Kashmir. The film gets more intense from here on. As Vihaan’s childhood friend and brother-in-law Captain Karan Kashyap (Mohit Raina) along with some other fellow army mates are martyred in this attack he seeks permission from the Army Chief to stage a come back and lead the attack teams. In reality, none of the officers were martyred in close combat with the terrorists in Uri. Before getting on board Vihaan even reminds his chief, ‘sir aap aksar kahte hain na, farz aur farzi ke beech sirf ‘aa’ ka antar hota hai aur main ‘aa ki matra’ ban kar rahna nahin chahta“. Interestingly, Vihaan was not quizzed by the Army Chief as to how he got this information that ‘surgical strikes’ were planned when there has been no leak from the unlogged special meeting in the PMO. Before the meeting, Vihaan was tipped off by a former colleague that they were going to take part in the special operations planned in the aftermath of Uri strike. After receiving the nod from the Chief, Vihaan puts together a team to conduct the surgical strike under the guidance of PMO bigwig Govind Bhardwaj (Paresh Rawal) with special orders from PM (Rajit Kapur) himself. Special Agent Pallavi (Yami Gautam) helps Vihaan to detect the location of the launch pads and details of the target (using Garud drones). And what follows is the execution of the surgical strikes across PoK. In his recent interview to ANI news agency, Prime Minister Narendra Modi had shared details of anxious moments spent by him while the ‘surgical strike’ was going on inside PoK. Responding to a query related to first ever surgical strike, Prime Minister had said, “In Uri when our jawans were killed, burnt… That incident made me bechain (restless) and there was rage within me… “I also realised that the anger in the Army was much more than mine. For the morale of the forces, they somehow wanted justice to be done with those who had been martyred. I asked them to draw up a plan, what was required. Think what can be done. Gave them a free hand. They planned“. “Twice the date had to be changed because I wanted full security for the operation. Finally, the operation was decided. I knew it was a big risk. …… Special training was imparted, secrecy was maintained. The topography and obstacles were kept in consideration, worst case scenarios were considered… It was a learning experience for me as well…Then we decided the date. And who will be where, of the main team. It was decided that before dawn, our men must be back. “…I was in live contact throughout, however, in the morning information flow stopped for an hour, I got anxious. Even one hour after sunrise. That time was extremely difficult for me. I couldn’t send a communication to them either…the period one hour after sun up was an extremely difficult time for me. My first priority was that my solider was alive“. As far as the writing goes, while the first half is a balanced mix of story, drama, emotions along with action, the second half is absolutely dedicated to action. The inclusion of a dramatic or emotional track in the second half could have elevated the overall effect of the film, at the same time diverting the audience’s attention and giving them a break from the nonstop action. Yami Gautam as Pallavi (Special Agent) /Jasmine (Nurse) could have been given more screen time. Interrogation of suspects and her briefings in the war room have been captured excellently by the cinematographers. Similarly, Kirti Kulhari as Seerat Kaur, IAF officer, too is slotted in a minimalistic role. Paresh Rawal is superb as Govind Bhardwaj, the screen version of Ajit Doval, who is shown traveling to the war room in an auto rickshaw. Making a great impression also is Paresh’s wife Swaroop Sampat, Mohit Raina as Major Karan Kashyap, Yogesh Soman as Ravinder Agnihotri, and Rajit Kapur as PM Narendra Modi has done well in their given roles. Though a special mention needs to be made for Raina who has done an exceptional job! On the other hand, Paresh Rawal’s character is repeatedly shown breaking cell phones, unfortunately, the context and reason why is never shown. However, he walks away with loud claptrap on screen after recognising the worth of young scientist and directing him to join the operations on ground zero along with his ‘Garud‘ drone. His punch line, “you may have won us the war” is a befitting tribute to unsung heroes who too participated in the surgical strike. The film had some lighter moments too. Aditya Dhar packs in little moments of joy that bring a smile/ tears to your face. Many an army man would be able to relate to the precious moments spent with loved ones, knowing well that it might be the last time they are seeing them. Your heart goes out to Major Vihaan when all he wants to do is go and hug his little niece and sister at his brother-in-law’s last rites, but the officer in him is not allowed to budge. Head and shoulders straight, he is only allowed a tear trickle. Leading a successful mission brings a smile to his face as much (or, maybe slightly more) as his Alzheimer’s-struck mother recognising him. The film involves fun characters like a Pakistani Officer, played by Rakesh Bedi, having a hilarious conversation with his employees. The Pakistani big-wigs are shown as a bunch of not exactly incompetents, but incapable of matching up to the Indians. The Background Music is appropriately used justifying the patriotic vibe of the film. The film is a fitting tribute to the Indian Army. Previous articleProf. Ganesh Ramakrishnan on What is DharmaWiki and Why its needed!! !